They really made me laugh. Nowhere is safe these days! So cute. 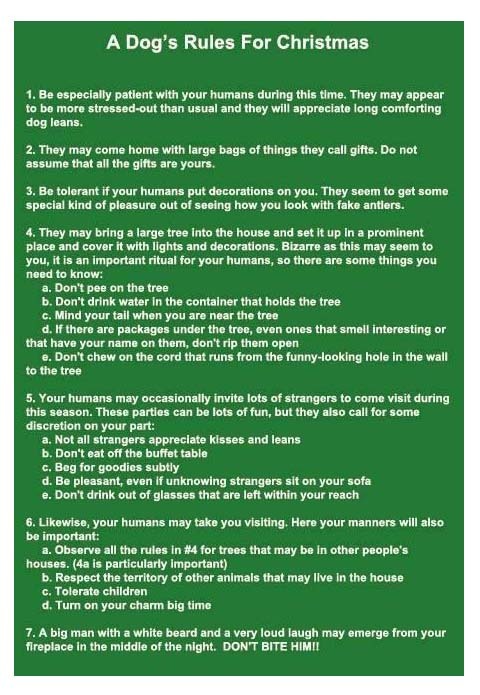 i will have to share this with my other dog lovin’ friends. So cute! Have you ever had a dog pee on your Christmas tree?!?! That made me laugh!!! This is rather an unreasonable and illogical set of rules. Especially No 7! Not from the dog’s point of view! Tolerating large burlgars in red suits simply isn’t on. I hope Chester reads these. He’s particularly good at the lean. LOL. this is so much fun. I wish I could have proof of this, but as I’ve alreay told you I have no pets.